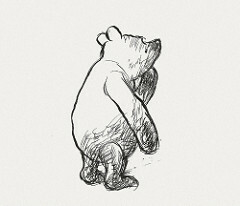 HomeCinema, television and theatreIsn’t it funny, how a bear likes honey? Isn’t it funny, how a bear likes honey? As if to prove this, the BBC is reporting that the taste of honey was just too tempting for a bear in Macedonia, which repeatedly raided a beekeeper’s hives, and has now been found guilty of theft and criminal damage (see also Daily Mail | Hearld Sun | News.com.au | NPR | NYT | Reuters | RTÉ | The Telegraph | UPI). My favourite headline from the coverage is the Syndey Morning Hearld‘s Guilty as a bear can bee. The history of animals in the legal system sketched by Evans is rich and resonant; it provokes profound questions about the evolution of jurisprudential procedure, social and religious organization and notions of culpability and punishment, and funda-mental philosophical questions regarding the place of man within the natural order. In Evans’s narrative, all creatures great and small have their moment before the bench. Grasshoppers and mice; flies and cater-pillars; roosters, weevils, sheep, horses, turtle doves – each takes its turn in the dock, in many cases represented by counsel; each meets a fate in accordance with precedent, delivered by a duly appointed official. Quite apart from the empirical inadequacies in his account …, Evans’ amusing and superficially uncontentious descriptions of medieval animal trials should not be accepted at face value. A much more recent, and considerably more balanced, view is provided by chapter three of Darren Oldridge‘s entertainingly eldritch Strange Histories. The Trial of the Pig, the Walking Dead, and Other Matters of Fact from the Medieval and Renaissance Worlds (Routledge, 2006; pbk | hbk) (entitled “They Hang Horses, Don’t They?”). That bring the bear necessities to life. I couldn’t be fonder, of my big home. To make some honey just for me. And maybe try a few! The bear necessities of life will come to you!